Does Red Lens Really Help When Hunting Varmints? The practice of using red lenses when hunting varmints is controversial. Some hunters are diehard fans of the technique, while others have reported the method to be ineffective and a complete waste of time. This article aims to demystify the conventional practice of using red lenses by shining much needed light on the reasoning behind the application of colors in nighttime hunting excursions. 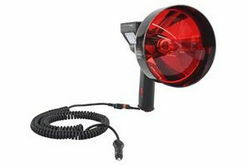 Red lens is highly favored by nighttime hunters, because red light beams are virtually undetectable by coyotes and foxes. However, some hunters claim that the animals get spooked by red light, while others are able to capitalize on the practice prolifically. In particular, many individuals have mentioned that the moment the edge of the beam hits the animals’ eyes, the creatures bolt in the other direction. Without scientific testing, it is difficult to eliminate other factors that could contribute to this reaction, such as the sound of the rifle, wind carrying the scent of the hunter towards the animal, and even the possibility that nocturnal creatures in the area have evolved to be extra vigilant when exposed to visual changes in their environment- due to the exploitation of the hunting technique. Furthermore, the intensity of the light may also affect detection during hunting. Some individuals claim that overly bright light beams can increase the possibility of spooking. Another crucial factor that must be taken into consideration is the type of animal being hunted in the field. Hunting practices for wild cats vary greatly, compared to wild hogs and deer. The creatures perceive light differently and applying the same technique across the board will generate inconsistent results. However, a common observation that numerous hunters have reported and can agree on is how nocturnal animals get spooked when exposed to light. Many claim that instantly cutting on the light in a pitch black setting scares the creatures away. As a solution, some turn on the light and hover it around the animal before slowly lowering the edge of the beam towards the eyes. This method is applicable to red and green lenses. Wild pigs are smart animals, and can adapt to changes in their environment quickly. When it comes to color detection, the creatures possess “rods and cones with two distinct wavelength sensitivities.” This special visual configuration was closely scrutinized by Japanese scientists in a published report from Journal of Ethology titled Color Discrimination in Wild Boars (School of Veterinary Medicine, Azabu University). During the trials, researchers tested the animal’s ability to discern red, blue, green and gray colors. The results of the study showed that wild boars can differentiate between blue and gray colors- but not red from gray, and green from gray. Based on the results, the scientists concluded that the creatures can recognize bluish color tones. The pigs failed to distinguish green or yellow colors. The Japanese scientists’ findings fully support the traditional application of green lens for hunting wild pigs. If lights were the only factor in spooking, then hunters (in theory) should be able to hide behind green light beams while hunting. So why are people reporting cases of spooking while hunting boars? As mentioned earlier, other hunting techniques could be raising red flags for the creatures. For example, bow hunters typically get close to animals before releasing the arrow to ensure a clean kill shot. At close ranges, scents and the sound of footsteps, breathing and scuffling become amplified. Shining the correct “invisible” light color may help in delaying or preventing detection, but it is not a complete solution for stealth. A closer look at a pig’s natural abilities suggest that their eyesight is staggeringly weak, but their sense of smell is superior. In fact, the animal can sniff out distinct and faint odors better than dogs. A study from the National Institute of Justice titled Pot Bellied Pigs (Law and Order Journal Volume 41, Issue 9; 1993) elaborates extensively on this unique ability and its applications in covert law enforcement operations involving illegal narcotics. When hunting varmints at night, most hunters recommend using an applicable “invisible” lens color, such as green or red, with a low to moderately bright intensity setting. Even if the animal cannot see the color of the light beam accurately, the beam itself may still be detectable through a different tone. Therefore, it is important to slowly point the light towards the creature by turning on the luminary and pointing it away from the target, and hovering the beam over the animal while tracking. To prevent light detection in close to moderate distances, try keeping the light intensity low. Some varmints, like foxes, have diminished visual capabilities at night, and can only “see” light beams when they are incredibly bright. Lastly, if you suspect that creatures in the field have adapted to the hunting practices of seasoned hunters in the area, it might be worth testing different lens colors.